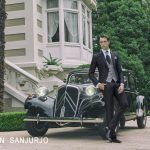 About Ramón Sanjurjo Spain wedding suits and ceremony. We were born from needle and thread, from love to traditional sewing. Ramón Sanjurjo is born from needle and thread, from love to traditional sewing. Our concern lives in the details, in the most perfect finish and our concerns are those of our customers: quality, aesthetics and design. Behind a name there is a human group with a great experience and a common thought: to offer the client excellence. They make it possible, season after season, for magic to emerge: Prêt-a-porter fashion and ceremony for an urban man, demanding and concerned about aesthetic beauty. We were born as a firm in 1992, under the name of Ramón Sanjurjo Design SL, when the namesake entrepreneur launched it on the market after years of experience in the sector. A Coruña (Spain) was the city that saw us born and that is where our headquarters is located. Dedicated from our beginnings to the fashion of man, we decided to give a change in terms of style and quality in the year 2005. It was then when we incorporated luxury materials and avant-garde and stylized designs that would become the hallmark of our brand. Since then, we have become part of the luxury fashion sector in Spain, Europe and Asia through the most select multi-brand stores in these countries and the most select El Corte Inglés centers. In Ramón Sanjurjo we convey innovation and exclusivity in each collection. Luxury qualities and exquisite details take center stage in both the Prêt-a-porter collection and the ceremony collection. Our patterns tend to fit the body, hugging it and without losing a bit of comfort, to achieve that stylized look that characterizes us. Avant-garde elegance for an urban man. All our garments go through a process of design, confection and production during which our designers and designers take care of the detail and the quality of the raw materials. We produce exclusively in Europe, with Spain and Portugal being the countries with the highest workload.